Out en femme last Tuesday, I bought three pairs of leggings at Macy's. When I took my leggings home, I realized that I needed a new top or two to wear with my leggings, so I added tops to my to-buy list for the next time I go shopping. I also noticed that I the majority of my dresses are blacks, grays, and browns, so I also added "colorful dresses" to my to-buy list. Today, I realized that in two weeks and two days, I will be traveling to Dayton for the Hamvention and time was a'wasting to buy clothes for the trip. So at lunch time, I grabbed my to-buy list and my Dress Barn dressbarn scratch-off discount coupon and went shopping at the Barn in boy mode. Saleslady Laura did not bat an eye when I told her I was shopping for myself and she helped me pick out a slew of tops and dresses to try on and that I did. After tryong on about six tops and eight dresses, two tops and four dresses made the initial cut. I eliminated one top because I thought it was too pricey and too see-through and I eliminated one dress (navy blue with white polka dots) because it was not "colorful." My scratch-off coupon only saved me 15%, but I did qualify for a free journal. Floral Cardigan and Tank Duet (top left). Gracing a tropical wash of watercolors, lacy silver-flecked blooms taper off into ruffling lace-trimmed sleeves and a fluid pointed hem. Attached lace-trimmed tank. Short tiered sleeves. Pointed hem. I think this duet will go nicely with my black leggings that have lace on the hem. 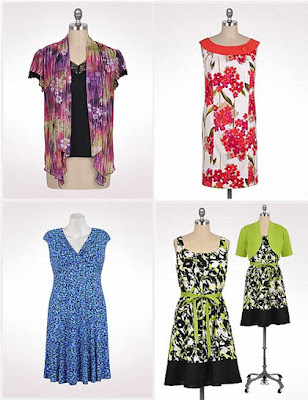 Collared Floral Dress (top right). Circled by a bright buttoned collar, summery shades of peonies and apple blossoms bloom atop the panels that ring the neck of this shift. 41" length from shoulder to hem. Nonfunctional button on collar. Center back zip. This dress is so cute; it just skims the top of my knees. Abstract Cap-Sleeve Dress (bottom left).Gentle gathers crisscross at the bust of a cap-sleeve sheath covered in abstract confetti of watery hues that ripple into a fluid skirt.44" from shoulder to hem. Lined bodice, light shoulder pads. Pull over. The photo does not do this dress justice. 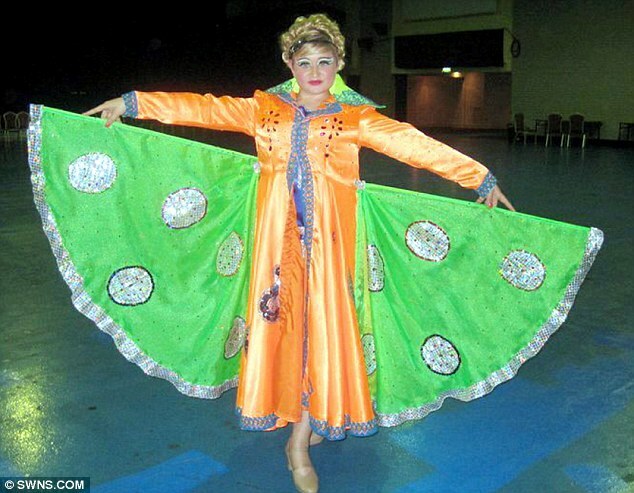 It is hugs my figure, covers my knees (yeah - I know - unheard of), and the color looks great on me. Bordered Abstract Dress and Bolero Duet (bottom right). This flared frock's leafy splashes of color are complemented by a matching grosgrain ribbon belt and bright bolero. 44" length from shoulder to hem. Hidden back zip with hook-and-eye at top on dress. Fully lined dress; elbow-length sleeves on sweater. This dress is probably my favorite purchase of the day. The skirt of the dress flares out more than the photo indicates and it looks so good without the bolero, I wear the dress without it. Now I think I am all set for Dayton except for packing. 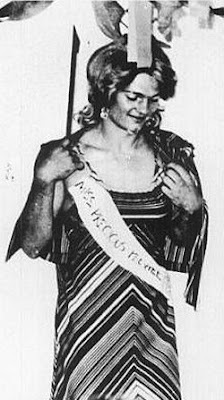 Wednesday's post about participating in a transgender Q and A session with college students in two human sexuality classes raised some questions from my friend Meg of Call Me Meg fame. Meg asked: Are you really surprised when you get Ma'am'd? - I passed as a woman. - The person who called me "Ma'am" or "Miss" did not look close enough to figure out that I was not a genetic woman. - The person who called me "Ma'am" or "Miss" figured me out, but was trying to sell me something, so they wanted to stay in my good graces by addressing me as feminine rather than masculine. - The person who called me "Ma'am" or "Miss" figured me out, but respected my gender presentation and addressed me as feminine rather than masculine. A funny story: When I went to work in office girl drag on Halloween a few years ago, shortly after getting to the office, my pantyhose began running like crazy! I don't know if they were defective or I was careless, but by 10 AM, I had three runs that were getting bigger by the minute. I wanted to look my best for the costume contest, so I left the building for a few minutes and drove to a nearby CVS to buy a new pair. I parked the car and walked into CVS passing a handful of people who paid me no mind. I entered the store and to avoid causing a commotion, I went to the first salesgirl I saw and explained that I ran the pantyhose of my Halloween costume and needed a new pair. "Hosiery is in aisle eight, Ma'am," she replied, unfazed by my Halloween costume hint. I guess I was not going to cause a commotion, so I went to aisle eight, picked out a pair, then I went to the register where the same salesgirl rang me up without a clue. Now, here is the amazing part. I never used a femme voice. I spoke in my normal male voice, which is admittedly soft-spoken, but definitely male. Go figure! 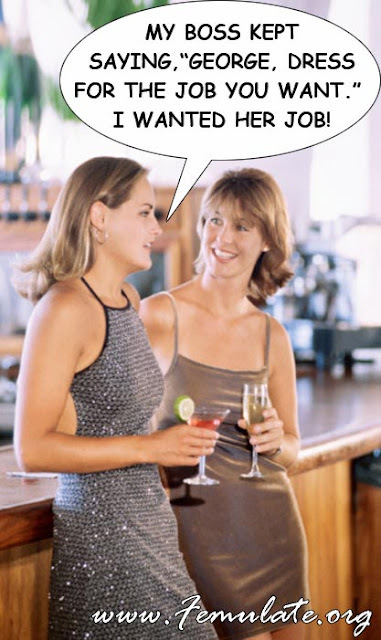 Meg asked: When you're out, has anyone used the wrong pronoun or the wrong salutation? I mean ever? And I bet that's something your fans in general would like to know. It's a great confidence-builder to know that the world is more accepting than we think. I can honestly say to the best of my failing memory that I have never been wrong pronouned unless it was in a situation where the person using the wrong pronoun knew I was trans and did not know how I preferred to be addressed. For example, in the classroom, the students know we are trans and sometimes address us with the wrong pronoun. Often they ask how we want to be addressed and they try hard to follow our wishes once they learn what we prefer. Another example: Over 10 years ago, I was attending a trans convention (First Event in Waltham, Mass.) and I checked into the hotel dressed en femme, yet the woman at the front desk addressed me as "Sir." It irked me at the time, but in retrospect, she probably did not know any better. Unless someone knows you are trans and not aware of the proper etiquette, the average person is not going to take a chance and offend you by addressing incorrectly if they are not sure of your gender. They will err to the side of caution. If you present as a woman, they will usually treat you as a woman. 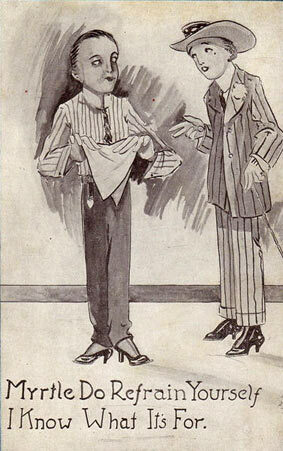 On the other hand, if you present as a man in a dress, all bets are off. Meg asked: You used to say you "crossdressed." What do you tell the students now? Do you tell them you'd go 24/7 if circumstances allowed? Or that you'd transition if you could? When I started participating in outreach, I said I was a "plain vanilla crossdresser" ...whatever that means. 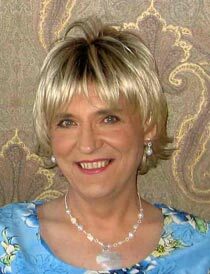 If my memory serves me correctly, from the start I also always said I would live as a woman 24/7 if I could, which kind of contradicts my "plain vanilla crossdresser" self-identification. For a few years now, I have been saying that I am transgender and "probably transsexual." 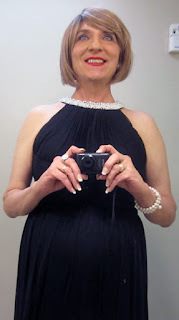 Regarding transition, I say I would skip the surgery (why mess with my 61-year-old body now? ), maybe do hormones, and definitely get permanently depilitated. "The Equal Employment Opportunities Commission (EEOC) issued a ruling on Monday that provides protection from workplace discrimination for transgender individuals. The ruling holds that Title VII of the Civil Rights Act of 1964, which prohibits discrimination against employees or job applicants on the basis of race, gender, color, religion, and national origin, should be applied to transgender individuals." 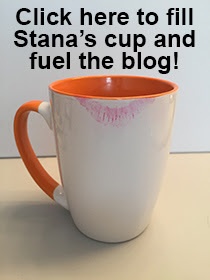 I'm so tired, I just got home and it is late, so I will write about my day out en femme tomorrow. It has been three months since I updated the Famous Females of Height ist! This time, I add two tall television actresses and two taller fashion models to the list. Gina sent me her personal criteria for what constitutes a “good “ womanless event. I mulled over her criteria; modified it slightly and added to it. Here is what we came up with: the Femulate Standards of Care for Womanless Events. 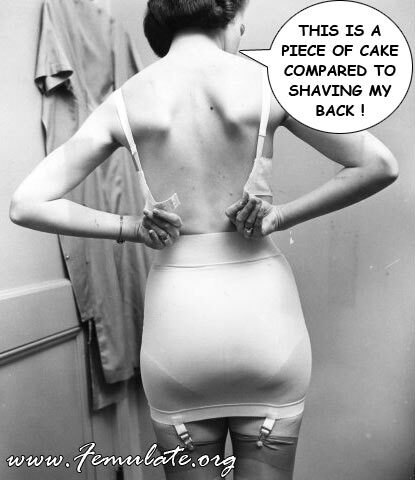 So, girls, those are your marching orders --- get gorgeous! The baseball season is underway and I am finally catching the baseball bug again after swearing off the game last fall. Watching Moneyball the other night got me in the mood and I took a break from doing taxes to watch a few innings of the Red Sox game on Sunday. I am also looking forward to the festivities surrounding the 100th anniversary of my favorite baseball venue on Friday. I loved playing baseball as a kid --- I could hit the ball a mile, but I threw "like a girl" and I ran so slowly you'd think I was wearing a tight skirt and heels. I'd like to wear a tight skirt and heels to a game someday. In the meantime, feast your eyes on the lovely lady in the accompanying photo; she is Mickey Mantle's nephew, Kelly Mantle. I often search eBay looking for images that depict femulation. Occasionally, some of the images I find are so weird that I cannot figure out what was the intention of the image or what was the image actually depicting. I came across two such images during my eBay search this week. It is a postcard from the 1930s or 1940s. Both persons are wearing male clothing except for their shoes, which are women's high heel pumps. The person on the right is wearing what looks like a Zoot suit. Both persons have male haircuts and both look like they are wearing makeup. "Myrtle" is folding a handkerchief, which I assume is object referred to in the text "I Know What It's For." My guess is that the postcard depicts two female-to-male crossdressers getting ready to go out and one is telling the other that she knows what a handkerchief is for. Does anyone have a better idea what this is all about? 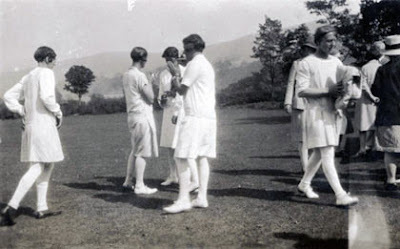 The second image that baffled me this week is a photograph from the UK circa 1920. It depicts a group of men in white dresses, hosiery, and shoes. They have men's haircuts that have been feminized by combing the hair over their ears. The seller on eBay states that the outfits may be "women's tennis clothes," but I see no evidence of tennis equipment. I have no clue about what this image depicts --- do you? 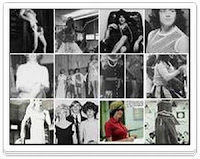 Cheryl e-mailed me links to photos and videos from the 2012 Groovy Teen Pageant, which occurred at Glenvar High School in Salem, VA, on March 2. Some of the femulations were so good that there may be a few future Miss Universe contestants in that group. 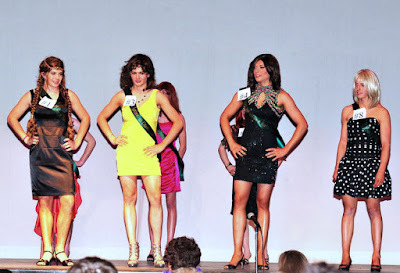 This link includes photos and videos of the pageant. This link has photos only. 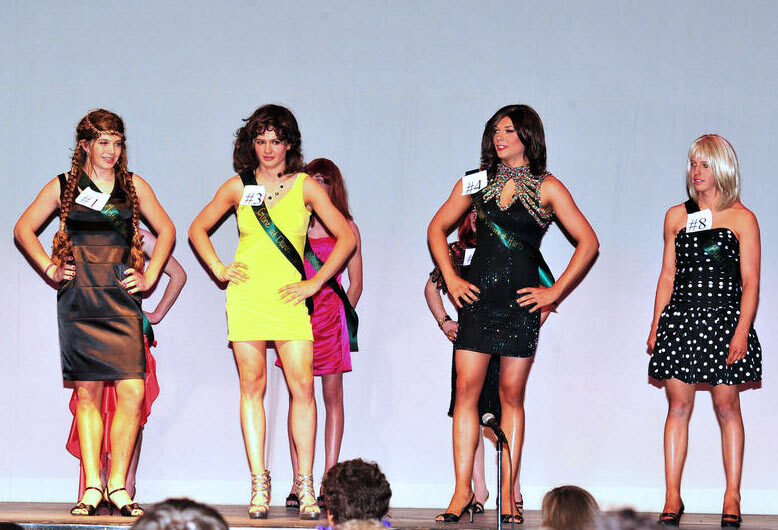 When I was in school, I was unaware of womanless pageants. And even if I had the opportunity to participate in one, I think I would have been too self-conscious to do so and out myself in the process. In my high school, they held an annual "Spanish Night," costume party for all the students who took Spanish. The theme of the costumes was something Spanish. One day in class a few days before the party, my Spanish teacher asked me if I was planning on wearing a seniorita costume. I guess she picked up on my femininity and decided to tease me about it. I had no plans to wear a seniorita costume. Instead, I dressed as a Cuban revolutionary in military fatigues, Ridgeway cap, fake beard, and cigar. My costume was a big hit. Another boy did show up in bad seniorita drag. He was a shy, quiet kid and I sensed that he regretted his costume choice. I wonder whatever became of him/her. 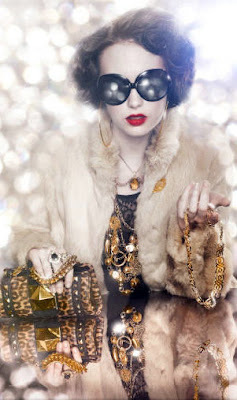 When I started going out en femme, I avoided eye contact by wearing dark sunglasses... indoors! I recall wearing dark sunglasses while shopping in a strip mall with another more experienced T-girlfriend. When we left the store, my girlfriend told me to ditch the sunglasses because everyone in the store was looking at me. Next store sans sunglasses, my girlfriend reported that I blended in better and she did not notice anyone looking at me. So I stopped wearing sunglasses indoors, but I made a great effort to avoid eye contact. The problem is that it is difficult to avoid making eye contact. Even if you make a concerted effort to avoid eye contact, you will find yourself inadvertently catching someone's eye. When this occurs, you may avert your eyes, but that is a mistake because the other person is going to notice your eye aversion and may wonder what's going on. They may take a closer look at you and try to figure out why you averted your eyes and while they are taking a closer look, they may discover clues that give away the fact that you are femulating. That happened to me a number of times. I inadvertently made eye contact, quickly averted my eyes and then noticed the other person checking me out from head to toe. I learned my lesson. Instead of avoiding eye contact, I now make eye contact. And I do it with a smile. Most times, the other person will return the smile and even say, "Hello." They assume that I am just another woman out and about because my mannerisms are not giving them any clues that will make them suspicious. Sure, my Amazonian appearance may give them clues, but at least I am not giving myself away with my mannerisms. Next time you are out en femme, make eye contact and see how it works for you. NEW YORK -- Transgender women will be allowed to participate in the Miss Universe beauty pageant next year, officials announced Tuesday, a week after they ruled a trail-blazing 23-year-old could vie for the crown this year. Pageant officials said they are working on the language of the official rule policy change but expected final word to come soon. Trials for next year's Miss Universe pageant begin this summer. You can read the rest of the story here on The Huffington Post. This is old news; I began hearing reports about this last week, but I just had a thought about it today when reading the above quoted HuffPost article. 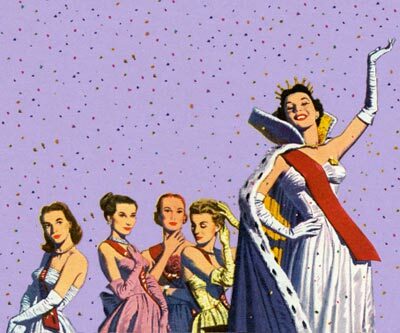 Will the amended Miss Universe rules allowing transwomen to participate in the pageant be all-inclusive? That is, will pre-ops and no-ops, as well as post-ops be included? Another Update: Here is a link to the full version of original article. Seems like the first time you visit that link, the full article shows up, but subsequent visits asks you to subscribe. The website must be setting a cookie, so read it the first time and don't click back. Update: The link I included here yesterday worked for me, but not for you! I just updated the link and hope it works for you this time. High heels seem to be the theme this week. Hot on the heels of two shoe posts here, The Wall Street Journal has an article today titled "Pushing High Heels to the Limit." 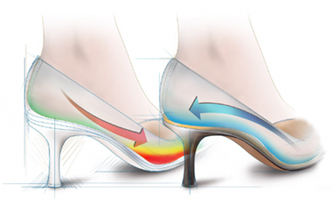 The article considers the question, "How high can a killer heel go—without killing your feet?" Here is a link to the article which "will be available to non-subscribers of the Online Journal for up to seven days." So read it now or regret missing it later. Thank you Sandy and Wertand for alerting me to this article. At the banquet Saturday night, Jen and I were discussing our love of high heels and she mentioned that she uses a shoe insert that allows her to dance the night away in 4-inch stilettos. I have tried shoe inserts in the past and have not been impressed, but Jen swears by the ones she uses and she e-mailed me the link to the product website. At the website, I learned that Insolia Inserts are different from the inserts I have tried (and discarded). Instead of adding padding to the shoe, which is basically what those other shoe inserts do, "Insolia Inserts shift weight off of the ball of the foot back to the heel by placing the foot in the optimal position for high heels." Jen's recommendation, customer comments on the website, and this review convinced me try them. So I placed an order and will let you know how they work out next time I go out en femme. Testing the Blogger app on my new iPod Touch. My neuroma had not bothered me much since the doctor gave me a shot last summer, but it started acting up about two weeks ago. Everyday there was annoying pain around the fourth toe of my left foot. It was not debilitating, just annoying. Twice a day for two weeks, I applied a prescribed ointment on the toe to ease the pain, but it would not go away completely. Before I slipped on my pantyhose and high heels Saturday night, I gave the toe a double dose of the ointment and my toe was free of pain throughout the banquet despite wearing six-inch platform heels for seven hours. Sunday morning, the pain was still absent and has been absent ever since. Go figure.